We are leading Medical Oxygen Generator manufacturer in India manufacturing medical oxygen generator, uses special grade of zeolite molecular sieve as sorbent, produces oxygen by making use of the PSA principle. Under certain pressure, zeolite molecular sieve has different oxygen/nitrogen adsorption capacity, i.e. Much more nitrogen adsorption capacity than oxygen adsorption capacity. PLC controls pneumatic valve on/off to realize two towers alternate adsorption and desorption as per pressure change, carries out oxygen/nitrogen separation and produces oxygen with desired purity. 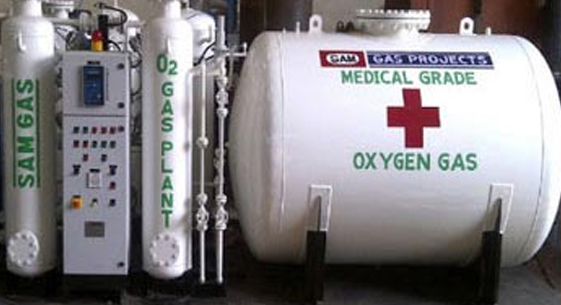 Oxygen gas plant is manufcaturerd and supplied complete in india as per standard scope of supply. 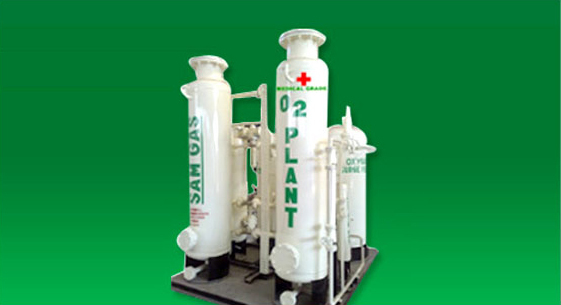 These Oxygen generators are equally suitable for Medical use as well, for providing Oxygen round the clock. As per US Pharmacopeia 93% purity Oxygen is very suitable for Hospital use. Thousands of such Gas generators are in use in Hospitals worldwide. This installation avoids Hospital dependency on scarce Oxygen Cylinders. Benefits include Low cost, decreased Administrative work & continuous and reliable Oxygen supply available round the clock. After the N2 & O2 Separation Device, there is a O2 after-cleaning, testing and controlling cabinet consisting of O2 cleaning device control system. Removing dust, eliminating bacteria and stabilizing pressure to ensure the oxygen output stably and meeting medical standards. 5 Short installation period and small ground treatment workload. On site supplying oxygen by piping net for human breath as the hospital oxygen center. Filling into cylinders and being transported to end-users.